First, I am sure many of you have family members, friends and colleagues in Haiti, who have experienced such a devastating tragedy and would like to let you know that my Family and I send our prayers and deepest sympathy to all. Very little sewing has been going on, but what little I did was revisiting Simplicity 2850 for the umpteenth time, what can I say, only that I am totally addicted to this pattern :) I'd purchased a printed lightweight jersey knit from Joann's using one of my 40% off coupons and immediately designated Simplicity 2850 for it. I didn't realized how lightweight it was until I started working with it and with that the fabric was a challenge wherein it was constantly being sucked into the throat plate. Also, I noticed that if I were to wear the top solo, a tank top was necessary due to the lack of opaqueness, but since I am on a cardigan kick, I sported the top to work with a cardigan. Here it is minus the cardigan, the color is the perfect autumn colors of olive green and brown. Despite my sewing being a lil lackluster, I've had the pleasure of new crafts, Soap & Candle Making which was inspired by Patrice. The Candle is vanilla scented and the soap bars are shea butter... totally love it. 1: Must leave a comment on this post Only. 2: Comments must be left by Saturday, January 23rd. The drawing will be held on January 24th pulling names from a hat. So have fun and participate... Good Luck. While visiting Dell, I was inspired by her cardmaking and hence...the beginnings of another craft....lol This is still a work in progress... I hit a bump in the road and couldn't think of what else to do....haha I pulled out my scrapbooking tools for additional inspiration, but became even more stumped and didn't continue. Hopefully, I will finish it, and this week will buy some how-to books to help me refine my cardmaking techniques. I find that I spend an exorbitant amount of time trying to find the right cards with the right words and in the end would settle for what is available. So this new venture is a perfect solution. Until then... have a Beautiful Day. Very pretty shirt. That color looks very nice on you! Great shirt! The design is totally a pair of shoes!!! :) Great job! Oh wow... now I want a pair of shoes, too! I'm not sure what you mean by guess this design. I say it's a pair of heels. I'm such a see horse I'm sure it is. If it's not, it sure is pretty anyway. Sheila, I want to believe that you have embroidered a lovely pair of high heeled maribou slippers. The heels are actually what I call "Mrs. Howell" slippers. Thought I could add that to my previous post but couldn't. I'm sure you get my drift. Gorgeous top! BUT, that's a pair of shoes. I can recognize shoes anywhere! Wher can I get the pattern!!! I love your new top!!! The fabric is gorgeous. It's cool you've gotten into some new crafts. My guess on the design is a pair of high heel shoes! HI Sheila! Your new top is fabulous. Love the color and pattern. The candle and soap look amazing! And the towel ... too cute. I love the design and I see high heel shoes. I've been reading about making soap. Is it hard? Happy 5th Blog Anniversary! As the daughter of a woman totally addicted to shoes (heels), I immediately recognized the pattern!! Mom even has an entire Christmas tree in one room with ONLY SHOE ornaments each year!!! As soon as I saw the towel, I thought of her! The shirt is really pretty! Love the top, nice colors and I LOVE your hair. I have no idea what the design it but I like it. Love the top. Looks good on you. I see High Heel shoes. Is there any craft you don't do?? You are amazing and so talented. Great shirt. The design is a pair of shoes. Nice job on the embrodiery. I love your bath stuff. Very spa. Great top - love the colours - it looks fab on you! YES love the top it looks lovely on you. Love the color and yes its a pair of high heel shoes. Your set looks gorgeous. Love the olive green top! Your new crafts look good too. I've made soaps but never candles.. you embroidery looks great!!! Sheila - that top fits you so well that you should make a dozen more because seriously would anyone at work realize its the same pattern! You don't need to enter me into the drawing but embroidery...the stuff that comes along with that can be overwhelming! Can't wait to see what else you make!!! Cute top! Yeah, Patrice starting all kinds of stuff! LOL she taught me to make them when she came visit me. I made some gift bags for the teachers at my kids school and a TON of the faculty wanted some, so now I'm selling them lol. Ha, I love it! Don't blame me if you get lost in the card making, lol. The shirt is cute -- doesn't look like it gave you trouble. And soap making, too? You're a regular B. Smith. Love the top, and I agree with Carolyn, you never can have enough of that top. It looks fabulous. Oh, and those shoes are hi-heel slippers. Whoo ! That green top is the stuff ! I wonder what you would charge to make me one JUST LIKE IT ?! I love it ! Shhhh, the answer is shoes. The design is "high heeled slippers" and I love the whole set. Would be lovely as a guest room/bath basket. Keep of the good work. Love that top! It's the perfect shape, perfect length... I can see why you like it so much! I LOVE your heels! How cute are they?? I agree with the majority looks like shoes. How do you like your embroidery machine? Thanks for the lovely compliments on my blouse. That pattern is my TNT and although I made several long sleeve versions, I will not hesitate to shorten them for the summer. @ Melodye, I have visited so many embroidery sites that I am not sure, a few places I have visited were embroidables, embroidery library, & secrets of embroidery. @ Mary Sarah, melt & pour soap is very easy, wherein the cold process method is more detailed oriented after talking to my sewing sister Andrea. The soaps are perfect for making spa gift sets. Definitely try it. @ Carolyn, I agree embroidery can be overwhelming during the learning curve phase and the purchasing of the paraphernalia needed. @ Madelyn, I am really enjoying my embroidery machine now that I am able to upload designs. I haven't purchased software yet. Such a gorgeous top, Sheila! 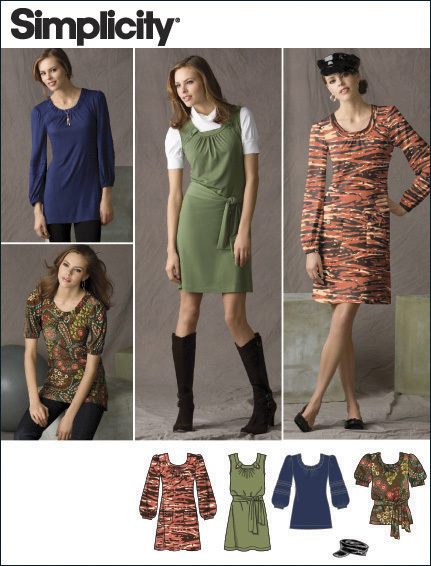 Isn't nice to have a favorite pattern that gives you so much versatility? You convinced me to add this to my list!